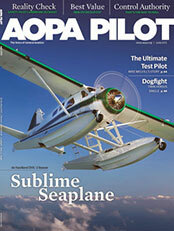 Please enjoy these articles and videos from the Aircraft Owners and Pilots Assocation (AOPA) magazine. Excerpts are below and you can follow the links to read the complete articles. 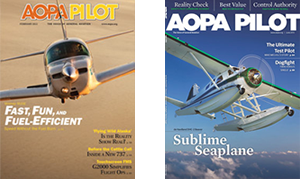 The small attach points on the side of the AOPA 2012 Sweepstakes Tougher Than a Tornado Husky are easy to overlook and have no real bearing on the way the airplane flies day to day. But those fittings are part of a floatplane kit that gives the Tornado Husky the potential to open up a whole new world of water flying for its winner. The factory fittings simplify the installation of straight or amphibious floats for flying on and off the water. And the Tornado Husky, with its excellent power-to-weight ratio; hard-pulling, constant-speed prop; long endurance; and stable, low-speed handling has all the attributes of a world-class seaplane. Turning final for a water landing on a placid lake, the de Havilland DHC-2 Beaver seems perfectly matched to its purpose. Flaps set to 35 degrees, all six wheels tucked safely inside amphibious floats, airspeed at 75 miles per hour, and descending 400 feet per minute into a 10-knot headwind that ripples the blue water surface of Central Florida's Crescent Lake. 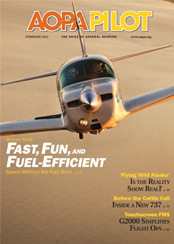 "This airplane looks like a truck, but it handles like a sports car," says Tripp Wacker, an FAA designated pilot examiner and owner of Ryan Seaplanes, which trains new seaplane pilots, as well as those seeking advanced ratings, in this beautifully restored 1953 airplane.